This post is cross-posted on The Nerdy Book Club's site. If you have not visited this wonderful community of readers, it is a must follow site! So, I am not a runner. This is not a surprise to anyone who knows me. But the thing is, I have been fascinated for years by runners, and I have toyed with becoming one. I actually have all of the knowledge necessary to become a runner. I have read many, many books about running. I subscribed to the print version of Runner's World for years, and I currently get their daily emails. 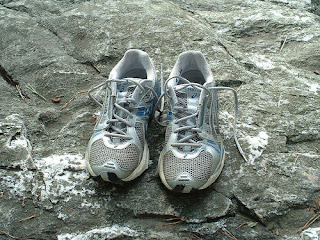 I subscribe to several blogs on running and follow some of the running news. I buy shoes at running stores and sometimes just hang out there. I listen closely when my running friends are talking about training for races, running injuries, etc. I have just never gotten around to actually…running. A few weeks ago, I was with a group of friends. One was getting ready to run his first half-marathon. He was talking about the gel packets he would have with him to keep up his energy. I knew all about these and was able to explain them to our non-runner friends. They were amazed that I (a non-runner) understood about race food. A week later, I was in a conversation with a different group of friends who had run the Chicago Marathon. They were talking about women in running skirts and I had remembered reading all about those on ANOTHER MOTHER RUNNER blog, a blog I read regularly since reading their book, RUN LIKE A MOTHER. On their blog, I learned that running skirts are all the rage. Women runners either hate them or love them. No happy medium. In the midst of this conversation with my runner friends, I wanted to jump in with some thoughts I had about running skirts. But then I remembered that I was not a runner and I did not have the credibility to talk about running skirts with real runners. I have been in several conversations lately that have reminded me how very much I know about running. I sometimes actually “know” more about running than my running friends. These are conversations that I am not quite comfortable participating in because I am not a runner. I am not part of the club. I just watch from the sidelines. No matter how much knowledge I have, I cannot call myself a runner. Running is not part of my life. I could probably not even run to the mailbox and back (and my driveway is not very long.) But here is the thing that I can't stop thinking about: I am certain I could pass a test on running. I am certain that I could probably pass a test at a higher level than most of my runner friends could. I have a lot of knowledge and understanding about running and feel confident about doing well on a test about running. I keep thinking about this and acknowledging the fact that knowing a lot about running is not the same as running. This knowledge might end up becoming important if I ever become a runner and it does help me in some conversations. But what good does that do me, really? When I don’t actually run? When I am not part of the club? How different this is compared to my life as a reader. Even though I attained a nearly perfect score on Tony Keefer’s quiz, “You Might be a Nerdy Book Clubber if…” , I don’t need anyone to tell me I am a part of the Nerdy Book Club. I don’t worry that some members read more than I do or that some members read faster than I do. I don’t worry about joining conversations that I have no business participating in. Even weeks when I can’t fit in a book, I know I am a reader. Reading is a huge part of my life and I don’t feel the need to prove that to anyone. One of my favorite things about my job as a school librarian is that kids stop me in the hall constantly, mentioning a book they finished or one they want to read. They tell me the page number they are on or an author they’ve discovered. Sometimes I wonder if reading is the only thing they think they can talk to me about. Then I realize that it is at those times that they see me as a fellow club member; that they know I will understand their need to share their reading lives. But I also see kids trying to get into the club. Standing on the edges of these conversations. Checking books back into the library with a bookmark about 1/3 of the way through, never having been finished. These kids seem to get excited when someone mentions an author they know. But they don’t feel confident joining the conversations. They don’t see themselves as readers. This year, I’ve bumped into lots of past students – students I taught in 4th and 5th grades who have recently graduated. It is so fun to see what they ended up doing, which passions they discovered. They tend to tell me all of that, and then often mention what/if they are reading. They know I’ll wonder and that no matter which career path they’ve chosen to follow, that I still hope they are lifelong members of the Nerdy Book Club. I like to believe that I was one of the people who first invited them to be part of this club. Each of us was invited into the club by someone who wanted us to be part of the fun. We saw something that we wanted to be a part of and there were lots of people in our lives who made joining the Nerdy Book Club possible. As a teacher, I know this takes commitment and hard work. I know it means giving kids great books, time to read, a reading community to be a part of, and instruction that moves them forward as readers. So in 2012 I have two goals. I am going to be very deliberate in helping every child become part of the Nerdy Book Club. I am going to watch carefully to see which students feel confidently part of this club and which are standing along the sidelines wishing to be part of it all. I’m going to try to give them the support they need to become lifelong members. And, of course, in 2012….I am going to actually run. Since 2012 will be a presidential election year, it seems appropriate to start brushing up on our presidential facts and trivia sooner, rather than later. In this book, every president gets a poem based on sometimes a little-known and sometimes a well-known fact about his presidency. The fact is elaborated briefly at the bottom of the page. 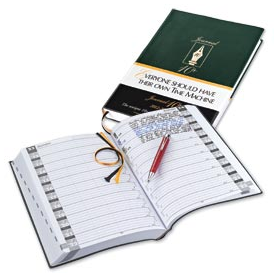 There is more information about each president in the back of the book, but it is as bite-sized and kid-friendly as each president's page -- you get dates of the term(s) served, birth/death dates, a quote, the president's nickname, and that president's "first." that took almost two hours to deliver. That was long. William Henry Harrison's election campaign was longer than his presidency. He caught a cold at his inauguration and a month later died of pneumonia. So, yes, I love the poems, but I also love how the facts at the bottom of each page elaborate or illuminate the poem in some way. And president #34, Dwight D. Eisenhower, was the first president of all fifty states. Julie Larios has the Poetry Friday roundup today at The Drift Record. Seems she has politics on her mind, too! 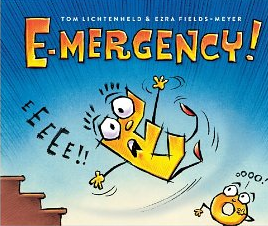 Well, I've got another pair of alphabet book that I'm betting stay off the shelf more than on, just like E-Mergency!. 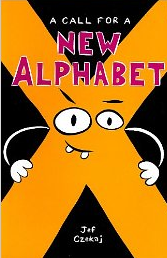 First sentence on the front flap: "X is tired of being at the back of every alphabet book." There's the "major conflict" in the story. First sentence on the back flap: "Jef Czekaj has a BA in linguistics." That explains just about everything else. Because X is tired of being at the back of the alphabet, and because he thinks more words should begin with him, X starts a campaign to change both the order of the letters in the alphabet, and their roles there. The night before the big vote, X has some strange dreams that make clear to him the hard work of the other consonants in the alphabet. He turns to the vowels for an easier job, but find that they, of all the letters, best understand that the letters of the alphabet have to work together, rather than in competition. Each has an important job to do. 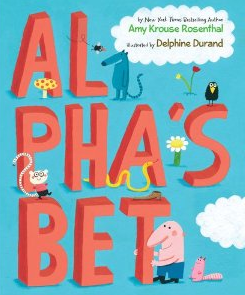 The illustrations are filled with all kinds of alphabetic sight-gags that will keep readers busy thinking about letters and words and the crazy English language. Al, the guy who lived back in history "when all sorts of things were being invented. Like fire. The wheel. Shadows." decides that he wants to invent the order for the newly invented set of twenty-six letters. He bets himself that he can win the King's contest to organize the letters with the most beautiful arrangement. 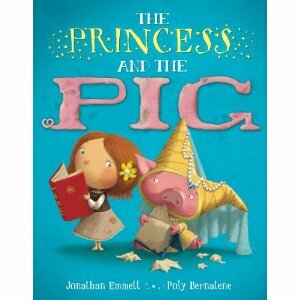 That refrain, "It's the sort of thing that happens all the time in books," occurs throughout the story as the pig grows up a princess and the princess grows up a farmer's daughter. There's a funny twist in the end that I won't spoil for you here! 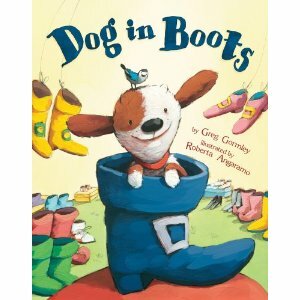 Dog gets the idea that he'd like some boots from the storybook in his lap, "...a brilliant book, all about a cat who wore a pair of truly magnificent boots." You know the book, but in case you forgot, there it is in his lap. Dog tries boots like Puss's, but they're not quite the right thing for digging in mud, so he takes them back to the shoe store. The accommodating shopkeeper trades the muddy boots for a pair of rain boots, and although those work fine for digging, they don't work too well when Dog goes for a swim. Over and over, Dog tries different footwear, only to discover in the end that his built-in footwear (his PAWS) are the best in every situation. Tired and happy, Dog plops down in his big chair with another brilliant book. "This time it was about a girl who didn't wear any silly boots, but did wear... (text deliberately excluded...can you guess what she wore!?!?) 'Hmmm...,' thought Dog." Prudence really really wants a pet, but her parents (seen only from the waste down in the illustrations) tell her they cost too much and make noise. So Prudence gets a pet branch. Branch is an outdoor pet who lives on the front porch and who has tripped Prudence's father eight times. "Dad broke Branch into little bits and put them on the woodpile." But Prudence is not daunted. She has a new pet. Its name is Twig. But Twig lives in her pocket and one day Twig runs away in the rinse cycle. Prudence tries one unique, inanimate pet after another. Her persistence finally gets her parents' attention -- just in time for her birthday. Another review at Colby Sharp's blog sharpread. This is a different kind of pet book. Jane has a pet -- a monster she finds in a red cap at the base of a tree (what is it with red caps this year???). Jane and Mizmow are best friends until the day they argue over the red hat, warm from the dryer, and pull it into two parts. Then, just like the hat, the two friends are pulled apart. Luckily, they find a way to repair their friendship in the end. If you've read any of the FLIGHT graphic novel short story anthologies edited by Kazu Kibuishi, that's where you've met these characters before. This book has a graphic novel feel to it, and would have worked perfectly well as a wordless picture book -- the captions seem like an afterthought. Another review at Lori Calabrese Writes! Are there still children who love to play with the box as much as they love to play with the item that came in it? I hope so! I know for sure that there are still children who will create a dollhouse and dolls from scraps of paper, because there's one in my fourth grade class. Here are a few books for those who have the gift of imagination, or for those who would blow the dust off theirs and bring it out to play. Ferdie doesn't want to go to school. "Not now," he said. "Maybe never..." But Ferdie's sister Viola knows how to get him moving. She holds out his coat and says, "Ferdie, look! I found your superfast cape! Quick -- put on your rocket-blaster books and we'll take off!" At this point, the black and white pencil sketch illustrations turn into full color 3-D paper sculptures...for as long as Ferdie's imagination stays engaged. Then Viola must come up with another imaginative scenario. In the end, Viola gets tired of having to be the one that provides the impetus to get Ferdie to school...but he comes through, and the two find the strength to walk the final block to school. With a very few supplies (don't forget the apron -- India ink is permanent) and the easy-to-follow directions in this book, you could be the first inkblot artist on your block! Not only are the directions clear, but the chapters progress nicely from the most basic to the most complicated designs/techniques. Spattered throughout the text (yes, pun intended) are short bios of "Inkblot Heroes," including (you guessed it) Hermann Rorschach, and others such as Victor Hugo, Justinus Kerner and Stefan G. Bucher. 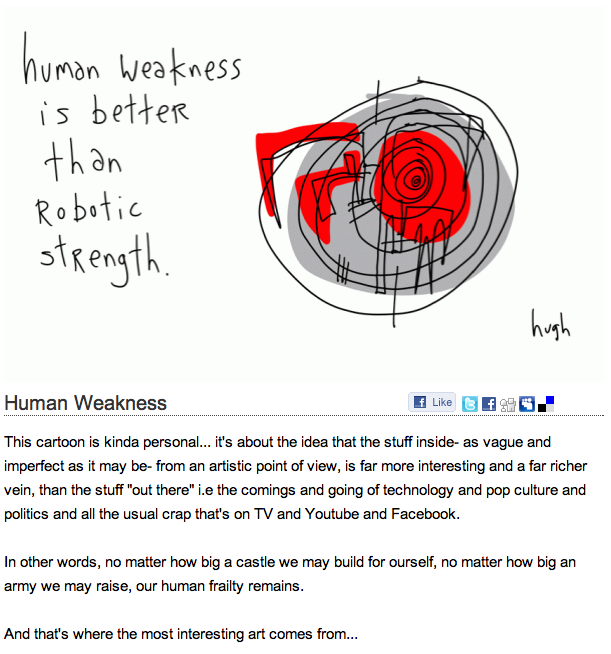 #1 As I was working on my Poetry Friday post, the Gapingvoid daily cartoon from Hugh MacLeod pinged into my inbox. It seems to talk nicely to today's poem, but I didn't want to clutter up my post with any chatter. #2 Here is the html code for the Poetry Friday roundups from January-June 2012. If it doesn't work for you to copy/paste from here, look for the code in a file on the Kidlitosphere Yahoo group. If all else fails, email me, and I'll send it to you directly! Thanks, everyone, for volunteering to host the roundup in the first half of next year! The Poetry Friday round up today is at Dori Reads. This is a very fun book! "A newspaper, to be sure, is nothing like a puffin. A newspaper is shaped like a rectangle and made out of paper. A newspaper has pages. It's black and white. But wait -- a puffin is black and white, too! What are the chances? A newspaper is something like a puffin, after all." After the newspaper come things that a puffin is more and more like, until we get to a penguin, which is very much like a puffin...but not quite. 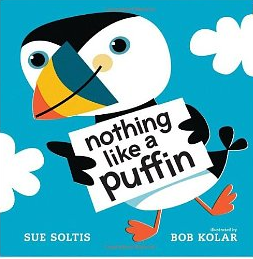 In the end, "There's nothing like a puffin!" The illustrations have their own story line, so the book begs to be read more than once to enjoy all the details. And this is a book that also begs to be used as a mentor text. Wouldn't it be fun to pick an animal or an item, find a few things that it is NOTHING like, then several things that it is SORT OF like, and finally one thing it is A LOT alike, and write with the same pattern? Yes, I thought so. We'll be doing this in our writing workshop after the first of the year! The wrapper reads, "Everyone should have their own time machine," and on the spine it says, "The Busy Person's Journal." The new volume that came in the mail today lies completely flat, while the one that holds bits and pieces of my life for this past 11 years bulges with movie tickets, quotes, newspaper articles (Lance Armstrong's wins, Oprah's book clubs) and columns (Joe Blundo, Craig Wilson)...and taped in are blue jay feathers and the piece of metal that punctured my car's tire. There are programs from lectures/performances by Amy Tan, Billy Collins, and David Sedaris. I marked the passing of my fourth grade teacher, the parents of several friends, Mike Hardin, Charlotte Huck, two good dogs, and The Series of Unfortunate Events. Each day is afforded only four lines in which to capture a moment: the first time the trees fully shade our street in the spring, the first locusts that are heard in the summer, the first sighting of Orion on my early morning walks in the late summer, the beginning of school, the laryngitis season of October, the birthdays (both 40 and 50 are captured within the pages of this volume), dreams, surgeries (back and gallbladder), trips, presidential elections, snow days, full moons, Fairfield County Fairs, irritations, embarrassments, celebrations, landmarks, crocuses, dog walks, and both good and bad restaurant experiences. Franki asked for the link to the company that sells these 10+ year journals, but I decided that I'd just get her her very own time machine. Merry Christmas, Franki!! Happy New Year again and again and again (x11). I hope you have as much fun capturing snapshots of your life as I've had capturing snapshots of mine. Over the last few years, I have been doing a lot of thinking around the idea of Digital Mentor Texts. I believe strongly in Reading and Writing Workshops to move all students forward in literacy. With the definition of literacy expanding, I believe that much of what we know of the writing process remains the same. The power of mentor texts in writing first hit me when I read Ralph Fletcher's classic book WHAT A WRITER NEEDS. He gave us great pieces to learn from as writers and new ways to work with our student writers. Another book that had a huge impact on my personal thinking about mentor texts in the writing workshop was STUDY DRIVEN by Katie Wood Ray. In this important book, Katie reminds us that inquiry has to remain at the heart of writing workshop. She says, "In an inquiry stance, teachers help children explore different alternatives for how to write something, and then let them do what writers really have to do and make decisions about how their pieces will go." (p. 27) Ralph Fletcher, Kelly Gallagher (WRITE LIKE THIS) , Aimee Buckner (NOTEBOOK KNOW-HOW), Lucy Calkins (THE ART OF TEACHING WRITING) Katie Wood Ray, Lester Laminack, Shelley Harwayne (LASTING IMPRESSIONS), Ann Marie Corgill (OF PRIMARY IMPORTANCE) and others have all given me so much to think about when it comes to the role of mentor texts in writing workshop. As I've been playing around with digital writing in the library, I realize that the decisions our writers have to make are also expanding. There are so many ways to write and create and so many decisions that writers make when creating pieces of digital writing. There are several of us who have been informally talking about the idea of Mentor Texts in the Digital Writing Workshop and we thought we'd have a more focused online conversation around the topic--to try to synthesize our thinking. Lots of us included our thinking in our sessions at NCTE 2011 but then followed up with conversations working through what the idea of mentor texts and inquiry-driven study mean for a digital writing workshop. In the midst of one of our conversations, an idea formulated about focusing some writing around it. So, during the week of January 8, we'll each be posting on our own blogs about the thinking we've been doing, the things we've learned from students, and our own writing. We are hoping you'll join us by thinking along with us about this idea of mentor texts in the digital writing workshop. You can join in the conversation by reading our blogs, posting your own thinking to your blog, commenting, etc. We thought this would be a fun way to have a larger conversation about ideas we are thinking about. We love the idea of pulling lots of voices together around one idea. Bill Bass, Technology Integration Specialist in Missouri and author of the upcoming ISTE book on Film Festivals tentatively titled, "Authentic Learning Through a Digital Lens" will be blogging on his blog MR. BASS ONLINE. Katie DiCesare, a primary teacher in Dublin who runs an incredible writing workshop will be blogging at her blog, CREATIVE LITERACY. Troy Hicks, author of THE DIGITAL WRITING WORKSHOP and BECAUSE DIGITAL WRITING MATTERS. He will be blogging at his site, DIGITAL WRITING, DIGITAL TEACHING. Kevin Hodgson, 6th grade teacher and author of TEACHING THE NEW WRITING will be blogging at his blog Kevin's Meandering Mind. 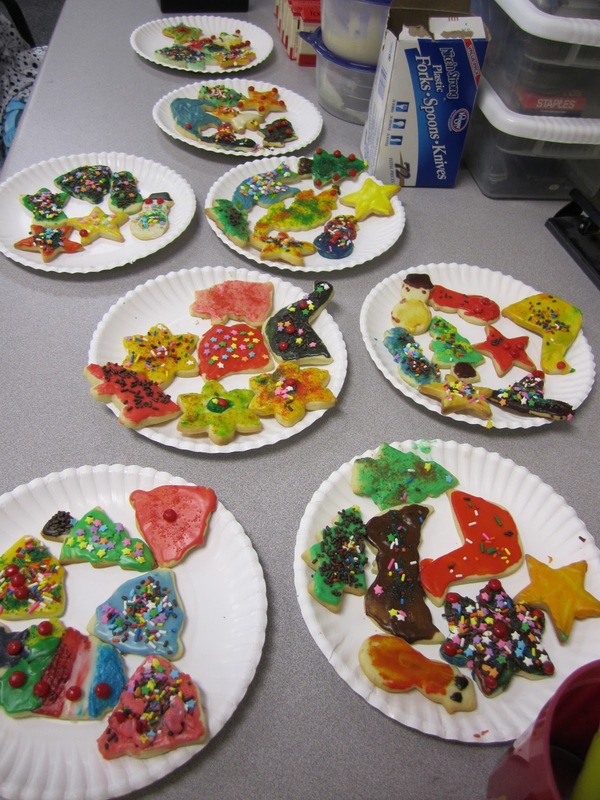 Tony Keefer, an amazing 4th grade teacher in Dublin, Ohio will be blogging at at ATYCHIPHOBIA. And I'll be blogging here. Each of us has committed to posting several times during the week of January 8 around the topic of Mentor Texts in the Digital Writing Workshop. I am hoping to revisit some of those staple professional books I mentioned above to reground myself in the role of mentor texts and what they mean for writers. We hope you'll join us in thinking about this! 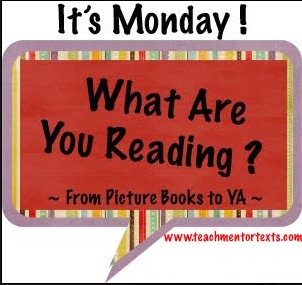 Joining Jen and Kellee (TEACH MENTOR TEXTS) and Katherine (READ, WRITE, REFLECT) again this week for It's Monday: What Are You Reading? I have somehow (against my better judgement) become a person who reads more than one book at a time. This is new for me! It is definitely an interesting way to read--haven't decided if I like it or not.... Even though we don't start winter break until Thursday, I have started my participation in The Book-A-Day Challenge started by Donalyn Miller. I participated over the summer and I find it not only fun and a great gift to myself, but it is a great way to catch up on my TBR pile. This week I finished THE AVIARY by Kathleen O'Dell. This is one of the books on Anderson's Book Shop's Mock Newbery list and I am so glad that I read it. It is definitely a unique read. A bit spooky and I loved the story and the characters. It is a great story about a little girl named Clara. It reminded me a bit of The Little Princess, a bit of The Secret Garden and a bit of The True Confessions of Charlotte Doyle (with a tiny bit of Home Alone mixed in...). It is truly a great book and a must-read in my opinion. I also read BONE DOG by Eric Rohman as it seems to be on many Mock Caldecott lists. I love Eric Rohman's work but this wasn't one of my favorites. One I will add to the library and glad I read it. Thanks to Mr. Schu's list on Watch. Connect. Read. I picked up a copy of THE ADVENTURES OF SIR GAWAIN THE TRUE by Gerald Morris. This book was one on Mr. Schu's list of the Top 20 books of 2011 that I hadn't heard of. I figure if it was on Mr. Schu's top 20, it was a must-read. (BTW, A huge CONGRATULATIONS goes out to Mr. Schu for meeting his reading goal of reading 2011 books in 2011!!) Anyway, I LOVED Sir Gawain and am so glad I read it. I am always looking for great short chapter books--especially those that might appeal to boys. This book has adventure and humor and is definitely part of a series I want to add to our collection. Another that I discovered on John Schumacher's list was AROUND THE WORLD by Matt Phelan. This is a fascinating graphic novels that shares the stories of 3 journeys around the world. I have tried (REALLY HARD) to stick with 2011 books, even as amazing 2012 ARCS are delivered to my door. When I opened a copy of Katherine Applegate's upcoming THE ONE AND ONLY IVAN I knew that I could not hold out reading 2011 books much longer. This one is due out in mid-January so I wanted to get to it as soon as possible. This was a great first 2012 book. 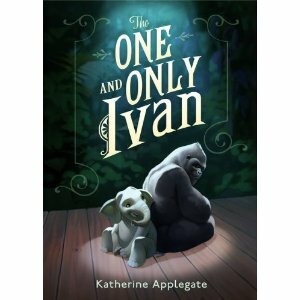 It is the story of Ivan, a gorilla who lives in a mall. He has a few friends but is lonely. When a baby elephant (Ruby) moves into the mall to be part of the daily show, things change. This is an amazing story. I loved Ivan and all of his friends in the mall. I loved the story and the format. And I loved learning about the true story that inspired the author to write this book. This is a must-read I think. An amazing upcoming book. So happy to have interrupted my 2011 Newbery reading to read this one! So, there are still so many I want to read, but I may have to dig into my 2012 books during this #bookaday vacation. EYE OF THE STORM by Kate Messner is next on my list for 2012 titles. I am so looking forward to reading Tom Newkirk's new professional book, THE ART OF SLOW READING. I have heard so many good things about it and love all of Newkirk's thinking. I have been saving it for holiday break when I have time to really dig into his newest thinking. Currently, I am reading SPUNKY TELLS ALL by Ann Cameron--a great early chapter book. I can already think of many kids who will love it. I may stick with my original plan to read more from the Anderson's Mock Newbery list or I may choose other things. I am keeping my reading options open this week! And sometimes try to remember. Read the rest of the poem here, at The Writer's Almanac. I struggle with the idea of keeping "the grand confusion of the world / Under (my) hat... / and teach(ing) small children to do this in their turn." In my opinion, "the grand confusion of the world" is all of the good stuff in the world -- all the mystery and wonder and magic in the world. And instead of teaching my students to quantify and qualify and categorize all of their fresh amazement about this incredible world that is so new and wonderful to them, I try to teach them to savor learning, to even savor the feeling of learning. For example, we started long division yesterday, a particularly perfect time to teach a child to stay in a place of patience with themselves and the process, rather than giving up and feeling defeated on the first try. make three times as many for others. 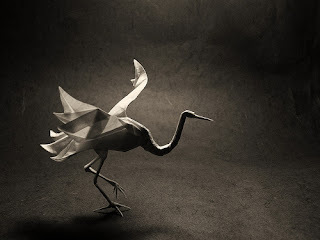 Kate has the Poetry Friday roundup this week at Book Aunt. Reading visuals is something we've been working on in the library. Charts and graphs seem to be extremely challenging for some students to make sense of, so that is a current focus. With the idea of reading expanding, our students need to have experiences reading various types of visual information and putting that information together with text. 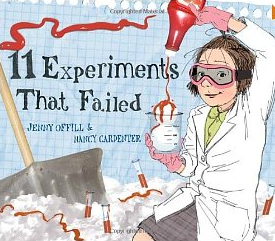 As part of this thinking, I read 11 SCIENCE EXPERIMENTS THAT FAILED by Jenny Offill and illustrated by Nancy Carpenter to our 5th graders. I love this character an have loved her ever since she appeared in the book 17 THINGS I AM NOT ALLOWED TO DO ANYMORE by the same author. In this new story, wonder is the key. The little girl in the story is full of curiosity. She has lots of questions about the world and works to answer them. For each question she has (such as "Can a person live on snow and ketchup alone? ), she shares her hypothesis and tests her theory. We had a ball reading the questions she had as well as the ways she went about finding out the answers. This was a great book for so many reasons. I am finding that lots of our students think that the way to find answers to their questions is to "search it up". If something isn't answered in a Google search, students suggest finding a book or asking someone. This book started a great conversation about questions that can't be answered in that way--questions that require active research. During the 2nd read of this book, we talked about the ways in which the narrator of the book could have recording what she discovered in her experiments. We talked about ways she could keep track of her data and what her charts and graphs might have looked like. For example, students suggested that when trying to determine whether her dog enjoyed being covered in glitter, she could have charted the time it took for the dog to shake the glitter off for several consecutive days. They described the chart that could be created to connect that information. We had a great time thinking about the possibilities for this scientist. Following these conversations, I challenged kids to create charts to keep track of data around questions they had. Several students moved forward with this challenge creating charts to determine average time needed to play 4-Way Countdown, tracking strategies when playing Mancala, and more. After three library classes, I can already see the interest in charts and graphs changing and found this book to be a great one to start these conversations. Whether you are looking for a book to start great conversations around science or just looking for a fun read aloud, I'd recommend this book. We are lucky to have a great public library system and wonderful children's librarians at our Dublin Branch! They have so much to offer our students and the kids love to see them when they visit the public library. This week, Miss Tamara from the Dublin Library is coming in to talk to students about possible Newbery titles. Today was the first day and I love to hear her thoughts and to listen in on the conversations . She shared possible winners and some new books that probably wouldn't win but were fun anyway! Students are most excited about learning about new books to read. I did learn about a few books I didn't know about. One I've added to my TBR stack are TRAPPED by Marc Aronson. Our 5th Grade Newbery Club has also been busy reading books from our 2011 titles. We've really just done free reading of lots of new books and especially of some that are getting some Newbery buzz. This group has been meeting since last January (they started as 4th graders and continued on this fall.) This week I asked members to vote so that we could create a short list that kids could focus on over the next month or so. Here is our Riverside Newbery Short List. I think they did a fine job--some great titles here! My name is Mary Lee Hahn, and I’m a member of the Nerdy Book Club. I could tell you the entire story of my membership, from my bookish childhood to the present, but instead, let’s pretend there’s a bookmark in my story and let’s open to one particular spot. Let’s start with last week. Last week I finished listening to Monsters of Men in the Chaos Walking series. If you are a member of the Nerdy Book Club, the above sentence will tell you volumes (pun intended) about me. You can empathize with the emotional rollercoaster Patrick Ness has taken me on over the past few months as I listened to all three books in the Chaos Walking series. You’ll know exactly when I cried, and you’ll know what moral and philosophical issues we could talk about into the night. Two of the readers I most admire in the world recommended this series to me, and recommendations are one of the hallmarks of the NBC – if it weren’t for the joys of convincing another reader to fall in love with our (new or long-beloved) favorite books, there would be no CLUB in the Nerdy Book Club. Not only do we read, we talk about books, blog about books, and tweet about books. Now that I’ve completed Ness’ series, I’m connected to those two readers (and all the NBC readers who’ve read the series) in deep and complicated ways. We share a reading history. Books build connections between readers and readers build connections between books. After finishing Monsters of Men, I needed to listen to a book that would heal my soul. On my Audible.com bookshelf was Charlotte’s Web, read by E.B. White – the perfect antidote for a dystopian future on a fictional planet: the cycle of life and friendship, anchored in the concrete details of Zuckerman’s farm. That’s another benefit of membership in the NBC: the knowledge that books can heal us. And did you notice what kind of shelf I went to in order to find my next read? It was my audio shelf. As a card-carrying member of the NBC, I have many shelves for my books: audio, e-book, poetry, cookbooks, adult, professional, and classroom, to name a few. Not only do I have shelves, I have piles. Most NBC members do. There’s a To-Be-Read pile…and another, and another and another. Mary Lee Hahn teaches 4th grade in Dublin, OH. She has belonged to the Nerdy Book Clubs know as the Cybils (she’s a round two poetry judge this year), the NCTE Notables, and the Central Ohio Kidlitosphere Bloggers. Ten years ago she wrote Reconsidering Read-Aloud. These days she blogs with Franki SIbberson at A Year of Reading, and writes occasionally for Choice Literacy. I have been thinking hard about the choices our students make in the library. I am in year four in the library and I've worked to build quality choices for students once we've finished the lesson and check out. A big goal for students in their use of the library is to find tools and resources that match their need. As the tools of learning expand and grow, I want our students to see how many options there are for learning and to discover the tools that best support them as learners. 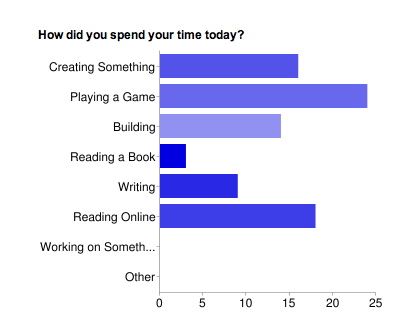 This graph was a Google Doc form that I filled out during each class over the course of a day in the library. I will look more closely at choices over time but wondered how kids were spending their time when given the choice. I found the results very interesting. There seem to be enough quality choices in the library at this point that kids are all choosing well. There seems to be something for everyone and I try to introduce new options every so often. We have spent time as a school talking about the importance of quality educational games so I wasn't surprised to see that so many kids chose to play one of these on the day I observed. I was thrilled to see the number of kids who chose reading during this time. Reading Online covered all reading that wasn't traditional book reading--so ebooks, websites such as Tumblebooks, researching a topic, etc. all fall under that category. And I loved to take the time to see what kids are creating with the variety of tools we have available. From creating a new story about The Pigeon in a blank book stapled together by library volunteers, to creating a book trailer, kids are working to create project and to learn new tools. I am amazed at how quickly kids can envision what a tool can do- they don't hesitate to think about all that is possible and then to problem solve to figure out how to make it work. One second grader taught herself to add video to a Pages project on the iPad while another learned how to create stop motion on the iPad this week. This was just a first step in looking at the choices in the library and how they work to meet the goals we have for our students in the library. 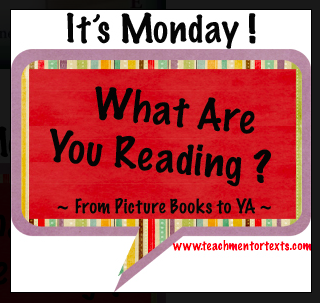 I decided to join Jen and Kellee at TEACH MENTOR TEXTS, Katherine at READ, WRITE, REFLECT and others for this meme this week. It has been a slow reading week. I've had lots of evening events, meetings, etc. Add that to getting ready for the holidays and I have had very little time for reading. SPARROW ROAD by Sheila O'Connor. As you probably know, I am working to get through a few more of the books on Anderson's Bookshop Mock Newbery list before January. I still have lots of 2011 books I'd love to get to but I'm not sure how many I'll have time for. With that said, I am so glad that I made time for SPARROW ROAD. This was definitely one of my favorite middle grade novels of the year. It is the story of Raine and her summer at Sparrow Road. Raine's mother decided that the two of them will be spending the summer at Sparrow Road, an artists' retreat. Raine is not thrilled about the idea but quickly makes friends and tries to solve the mystery of the people who used to live there. This is a story of friendship, family, loss, and acceptance. Definitely one of my favorites of 2011. I read a few picture books this week. GOOD LITTLE WOLF by Nadia Shireen is a fun picture book about a good little wolf who meets a big bad wolf. The big bad wolf tries to convince the good little wolf to be bad. A fun book with a surprise ending. I am always looking to add to my wordless book collection. 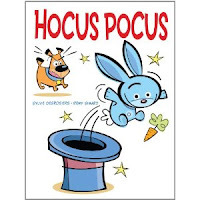 This week, I picked up HOCUS POCUS by Sylvie Desrosiers. This is a fun wordless book that has a Tom and Jerry feel. The format is more of a graphic novel format and the story is a fun one. Many of the wordless books I have tend to have a more serious tone but this one is pretty fun so I am glad to add that variety to my collection. 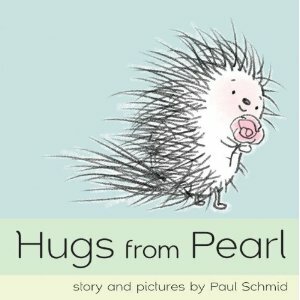 HUGS FROM PEARL by Paul Schmid is another fun picture book that I'm anxious to share with students. Pearl loves to give hugs but the problem is, she's a porcupine and her hugs tend to cause her friends pain! Not to worry, Pearl comes up with a great solution. I also picked up GIANT POP OUT FOOD (Chronicle). Who doesn't like a good pop-up book? My first graders have doing lots of reading like writers--really looking at books and thinking about what the writer did and how they might try something similar in their own writing. I thought this series of books might stretch them a few of them a new direction by giving them a new type of writing to try. Or they just might enjoy the fun riddles and pop-out illustrations. I am currently reading the middle grade novel THE AVIARY by Kathleen O'Dell. This is one from the Anderson's Mock Newbery list. I don't know that I would have picked it up had it not been on Anderson's list and I am really enjoying it. Hoping to finish this one this week. Have a nice day. Have a memorable day. Have (however unlikely) a life-changing day. Have a day of soaking rain and lightning. Have a confused day thinking about fate. No matter what kind of day you have today, no matter how many ups and downs and wanderings with no crumbs to follow, I hope it includes some time spent with poetry! The Poetry Friday roundup today is at Read, Write, Howl. I'll admit, I'm a little surprised to be reviewing this book. 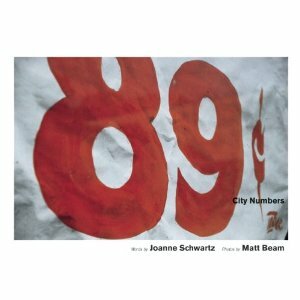 Photographs of numbers around you in the city? Big deal. The book starts with 000. Not much of a surprise. Next up is... 1/2 ?? Hmm... Then 1, and... 2nd (second). That's exactly how long it took me to be hooked -- as soon as I wasn't sure what was going to happen on the next page, I was eager to see what number came next and where it was found. (Each two page spread has the photo on the right, and on the left, the number, in digits and words, and the location and media. 2nd is "Printed on paper, pasted on steel. Electrical box." Besides cardinal and ordinal numbers, the book includes decimals, percents, prices, and one iconic number: 007 ("Double-O Seven"). Two things happened when I read this book. 1. I said to myself, "I can do that." And then a half a heart-beat later, I said, "I'm going to do that!!" Here is my theme for my photos in 2012: I am going to look for numbers in my environment in all varieties of media, location, and form. Suddenly, I feel reinvigorated to continue my personal Project 365 for a fourth (FOURTH!!!) year. 2. I wanted to get this pair's book City Alphabet and see what they did with letters and words in a similar format. I will not limit myself to numbers next year, I will also look for words and letters. Maybe. Maybe I need to be patient and stay focused on one theme at a time...hmm...stay tuned for a decision on that one. Which letter in the alphabet is used with the most frequency? What happens when E comes down the stairs too fast and breaks her leg? An E-mergency! E is taken away in the ambulance and A assembles the rest of the alphabet to discuss how they will proceed without the letter E. "Someone is going to have to take the place of E while she gets better. O, you're the obvious option because you're so well-rounded." This book was really funny! The book was really good! We figured out who was using the letter E! E never learned her lesson! The letter O is used for E in this book and that makes the words hard to figure out sometimes. It's funny that the characters are letters and they sometimes do what their letter says (like...P)!! The letters sometimes spell funny words like ROAD when they were getting ready to go on a trip or EGGS and OJ when it was breakfast time. I like how O fills in for E. If that really happened, our names might change! The first thing you'll do when you pick this book up is look at all of the CUTE photos of unusual and extraordinary animal friends -- monkey and macaque, giraffe and ostrich, capybara and squirrel monkey...and my favorite, the toad and mouse. Then you'll go back and enjoy the rhyming text. Finally, you'll want to know the story of how each pair of animals became friends, and you'll go back to the nonfiction paragraph below each poem to find out more about the animals, where in the world, and how they became friends. Jacqueline Ogburn, author of A Dignity of Dragons: Collective Nouns for Magical Beasts, seems to be the kind of person who loves words, and language, and quirky terms. 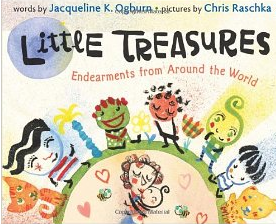 In Little Treasures, Ogburn has collected parental terms of endearment in fourteen languages. There are three or four terms from countries as far-flung as Uganda, the Slovak Republic and Argentina. The borders of many countries are dissolved by including terms that Russian-speaking or Arabic-speaking or Hindi-speaking people use. For the non-English languages, there is a pronunciation guide, and for the languages that do not use the Latin alphabet, the term is written in the alphabet of the language, and the pronunciation guide includes a Latinized version of the term. Through it all, Chris Raschka's illustrations emanate love and joy and playfulness. You'll want to pick up your own "little coconut candy," your own "habibi/beloved," your own "Knuddelbaerchen/little huggy bear" and snuggle and cuddle and call them whatever it is that YOU call your little one. There are no little ones in my house (well, not counting the cat...), but I can't wait to take this book to school and see if my students can add to this list. One my mom calls me, "pumpkin," is in the book, but "sugar plum" is mine, all mine! What are YOUR favorite terms of endearment for your children, and what were YOU called as a child? This summer, my friend, Drew Jones (our school's amazing art teacher) created this video at the Ohio State University library. Somehow I missed it until today but I am sooooo happy I found it. And I had to share So lucky to teach with him. Enjoy! Fortress from Corey Aumiller on Vimeo. At NCTE, I picked up some great 2012 books that I can't wait to read. I am tempted to move to my 2012 stack. And blog posts such as the one at READ, WRITE, REFLECT about Jo Knowles' new book don't help:-) But I know that if I dig into those, I will most likely never come back to the 20 or so 2011 middle grade novels I had hoped to get to this year.This year, I have read more than any other year. I have read nearly 300 books and have enjoyed almost 100 percent of those books. I give full credit for this to my friends, both local and online and the fact that Goodreads, Twitter and Facebook have all allowed me to find the best books out there. But, with the number of amazing books out there, it is easy to miss some great ones every year. So, 2012 is only a few weeks away. I still have many, many book from 2011 that I hope to read before I move into the 2012 books. But in reality, I know I can't get to all of them. There is really no good way to decide how to prioritize my next read stack when it is packed with so many great books. My favorite strategy was the one that John Schumacher used to prioritize his next read stack. It was quite brilliant and I would highly recommend it! I have decided to use Anderson's Bookshop Mock Newbery List to help me prioritize. From what I hear, Anderson's ALWAYS has the winner on their short list. 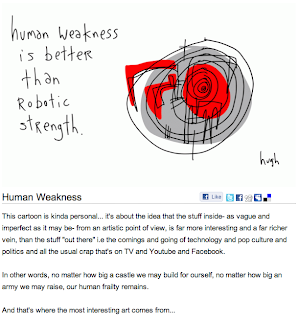 I've also payed close attention to Betsy Bird at Fuse #8 and the Heavy Medal blog. I am looking forward to Holiday #bookaday to help me catch up again. I had my own Thanksgiving #bookaday this year and was able to read WORDS IN THE DUST by Trent Reedy, THE GREAT WALL OF LUCY WU by Wendy Wan-Long Shang, THE UNWANTEDS by Lisa McMann and GHETTO COWBOY by G. Neri. I'm glad I spent so much time reading over Thanksgiving as I would have hated to miss any of these amazing titles. I just finished SPARROW ROAD by Sheila O'Connor last night and loved it. I found this one on the Anderson's list and again, so glad I didn't miss this title. This is for sure one of my favorite middle grade reads of the year. Below is the rest of my stack and how I have prioritized. I am sure it will change often before January 1, but for now, it gives me a bit of direction. I guess overall, this is a good problem to have-so many great books to read! I will keep you posted and hopefully get through a good bunch of these in the next few weeks.